If you’re like most people, you’ve noticed that the cost of food has been steadily climbing over the past few years. Even staples such as bread and milk are now pricier than ever. 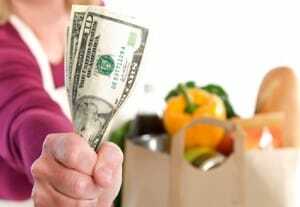 How can you stretch your grocery dollar without feeling deprived? By following a few simple tips and tricks you can feed your family delicious and nutritious meals for a fraction of the cost. With a little careful shopping and flexibility you can often score huge savings by looking for perishable items, such as meats and baked goods, that are reduced for quick sale at your favorite grocery or big box store. Often, the stores will mark down meats and bakery items that need to be used or frozen within one to three days in order to sell them quickly. These items are usually still very fresh and can be frozen for later use if you and your family won’t be able to eat them immediately. This simple tip can result in a savings of 50% or more. Convenience foods such as frozen entrees and pre-packaged snacks can be a lifesaver for the busy family, but can also put a huge dent in your grocery budget. One way to get the best prices on these items is to visit your local outlet store or grocery re-seller. These stores specialize in selling excess products from other supermarkets at a fraction of the price. Some of my favorite finds at such stores include granola bars marked down to $0.99 a box (up to a 75% savings) and family sized frozen lasagna’s for $1.25 each (an 85% savings). For the most savvy grocery shopper, the money saving doesn’t stop when you leave the store. A little advanced planning and preparation can go a long way towards stretching your dollars. One easy activity that yields big savings is making extra of your favorite meals while cooking and then freezing the left-overs in individual portions instead of buying store bought frozen meals. Similarly, doing some prep work yourself, such as buying whole vegetables and washing and cutting them yourself, or buying a whole chicken instead of pre-packaged boneless skinless chicken breasts can result in enormous savings. Armed with these tips and tricks, you can feed your family delicious and nutritious meals for a fraction of the cost.